A breathtaking fusion of kitchen and architecture which delivers a crescendo of visual stimulation whilst achieving quiet functional order! Kitchen Design Evolution! A New Beginning! 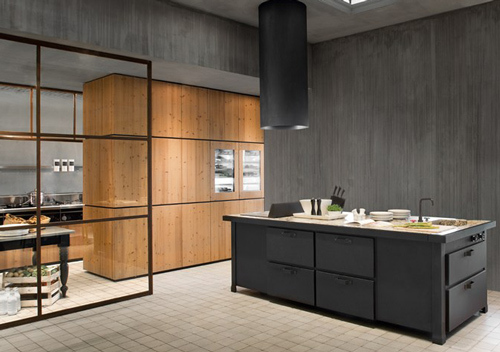 The search is on for a contemporary kitchen that will evolve past the flat expanses of uniform glossy panels; and that is why kitchen designers at the leading edge of the industry are now exploring angular definitions. 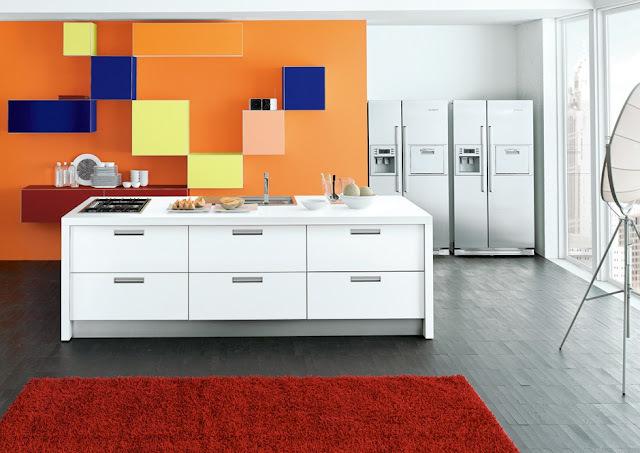 Contemporary kitchen design is mutating and the process is beginning to deliver the next generation of kitchens. These new designs are loosely built upon the flat linear lines that made contemporary kitchen design such an unstoppable commercial freight train, but now designers are adding some subtle punctuation to their designs. The use of depth, height and colour variation allows the popular linear appearance to stay, but it is now re-energised to create a completely new look. 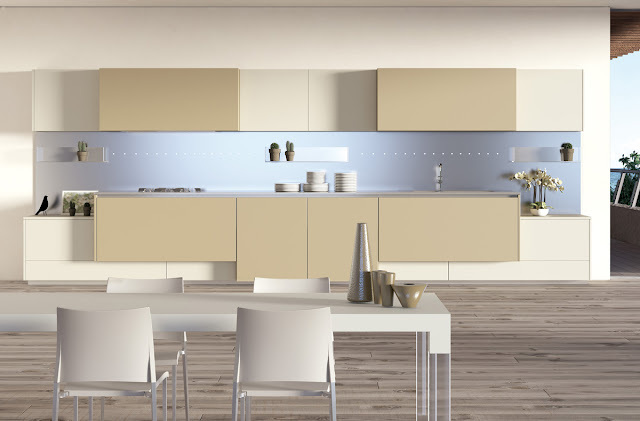 Higher cabinetry sections become functional pods whilst lower sections blend more easily into a living space. Key functional elements can appear less obvious because the viewer is distracted by aesthetical variations within the design. 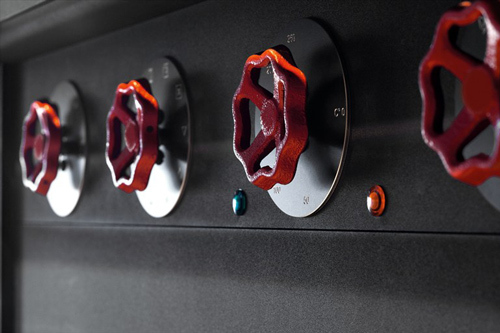 By becoming more intensely scrutinised, kitchen designers are now beginning to deliver a product that is respected for its complexity and quite simply, its design! There is a fruity flavour to this design with the vibrant colours of nature being allowed to randomly explode over the back wall. This abstract approach certainly brightens up this otherwise mundane design with variations in cabinetry size and colour creating functional niches and expressing artistic preference for all to see! The Mogul wonders where the oven housing disappeared to and why was it placed so far away from the hob! 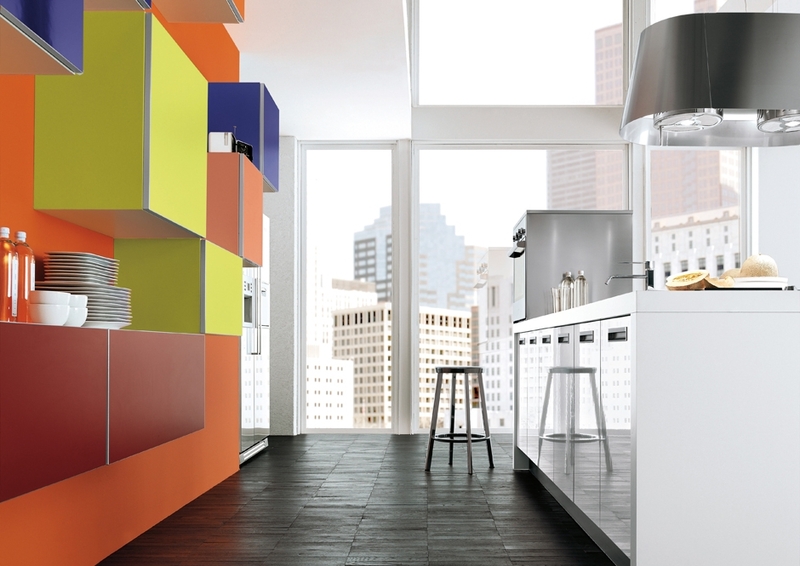 Fragmentation of kitchen zones can become problematic, reducing efficiency and functional flow! Remember aesthetic flamboyance is one thing but function efficiency is king! 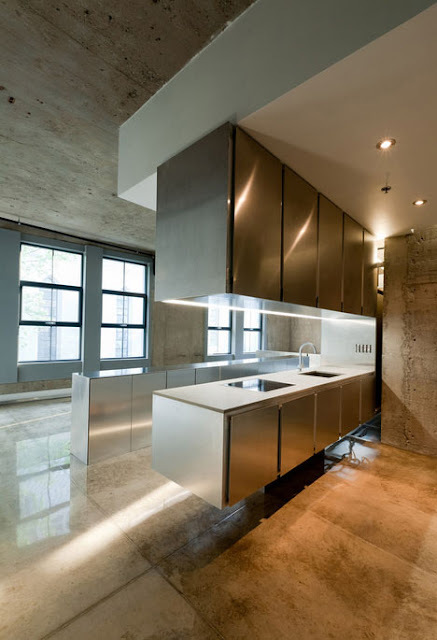 Selecting metal as a material from which to create the physical manifestation of your design is a statement of intent. Metal is cold, strong and exudes the kind of unforgiving steadfastness that is needed when going to war! There is no room for soft geometry or frilly curtains in this design as it sits menacingly awaiting the next culinary conflict to begin. Even the fittings are brutally practical resisting smooth ergonomic design and embracing the kind of functional aesthetics more commonly seen by a German U-Boat commander. 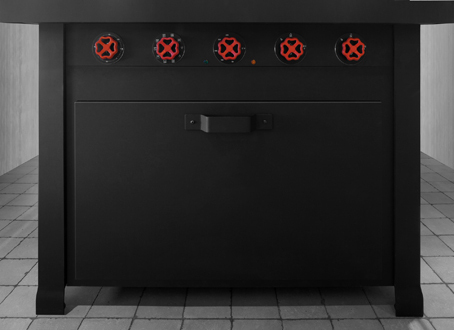 This design is tough and unforgiving bringing masculine dominance to the kitchen environment! Within every kitchen design there is compromise, an agreed armistice between conflicting elements that can only be brokered on a very personal level. 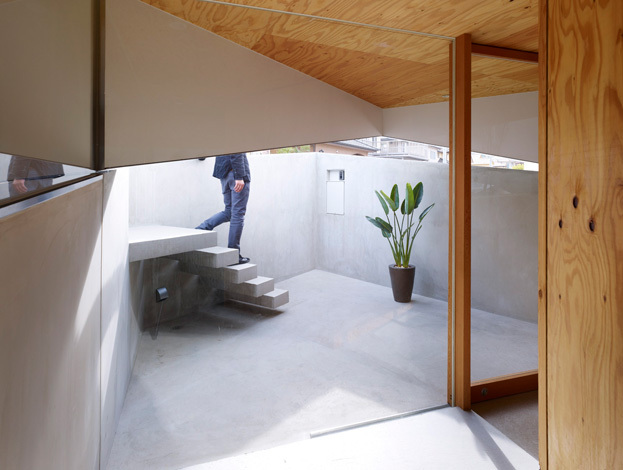 The battle raging between form and function can evoke some opinionated outbursts, but after consideration and reflection every design will find its natural equilibrium. 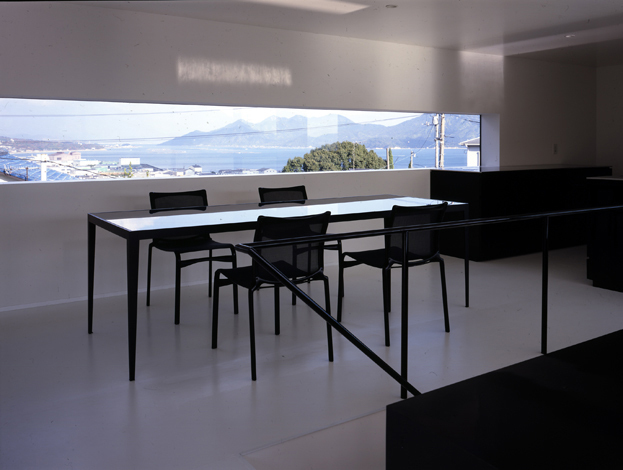 Creating lines that deviate from conventional 90 degree angles will help deliver a strong aesthetic presence. 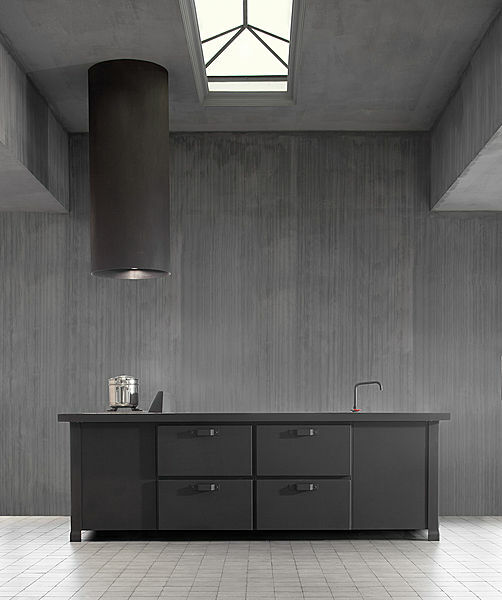 In this instance the unconventional approach is amplified by using monochrome accents that give this kitchen a futuristic feel. 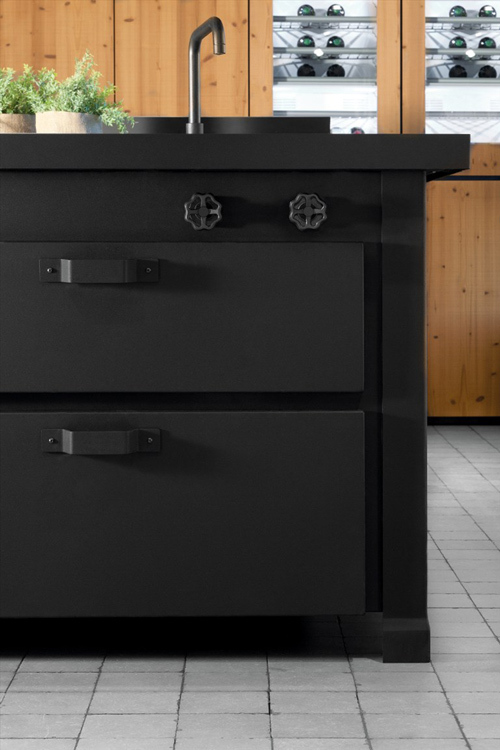 The compromise for creating this look is the purposeful restriction of natural cabinetry size and the complications that will arise when placing internal drawer systems! Justification in the form of client satisfaction always repels criticism! The Mogul loves this one! 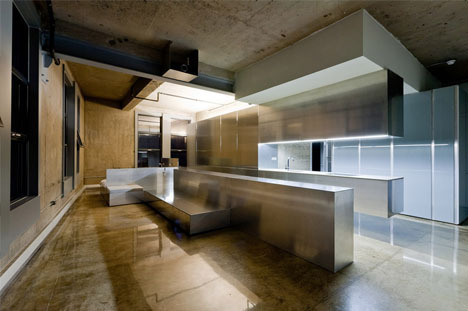 Expressively flamboyant architecture, shy and oppressed kitchen! This on trend kitchen has some subtle design features which make it quite unique. 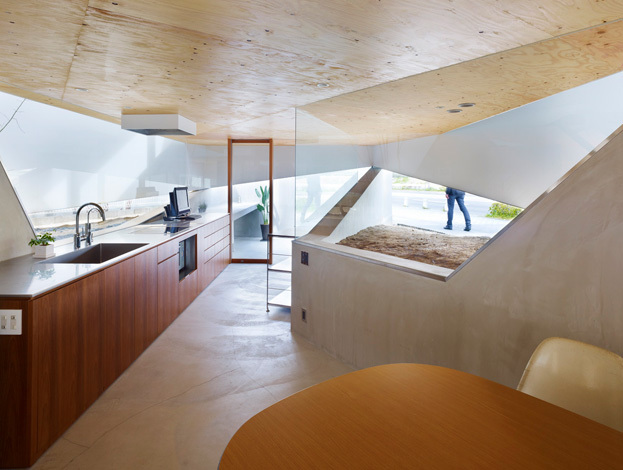 The extraction system has been detached from the kitchen, instead being merged into an architectural multi-media pod, which drapes itself over the functional island. 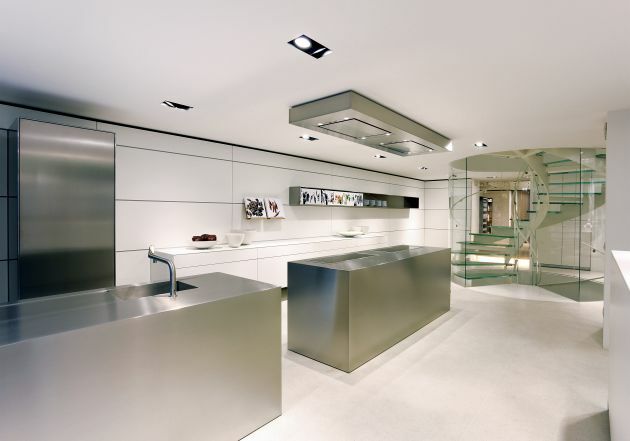 Heavier stainless steel worktop mirrors the ceiling feature by enveloping the island to create a multi layered work surface. These double impact features may at first appear independent or unobvious but their positioning and shape add continuity to the design while delivering the required functional performance. Resisting the urge to centre the oven housings along the back wall also adds the right amount of contemporary asymmetrical styling to this design to make it quirky and trendy. 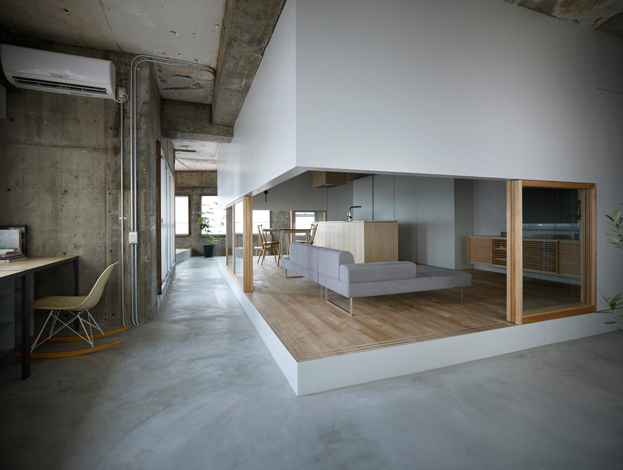 At first glance it might seem that this is your average, run of the mill, been there, done that white monolithic kitchen, but upon closer inspection it seems that this design is attempting to raise the bar by creating division. The snow blinding whiteness helps to camouflage a deep functional gorge, an abyss that strikes though the heart of this kitchen like a hot knife through butter. This worktop fracture acts as a docking station for contrasting walnut accessories which help stimulate the design and assist functionality. It could be argued though that this unique feature could resist its intended functional programming, unwittingly attracting worktop elements in an invisible gravitational tractor beam and causing them to fall beyond the natural reach of the user. 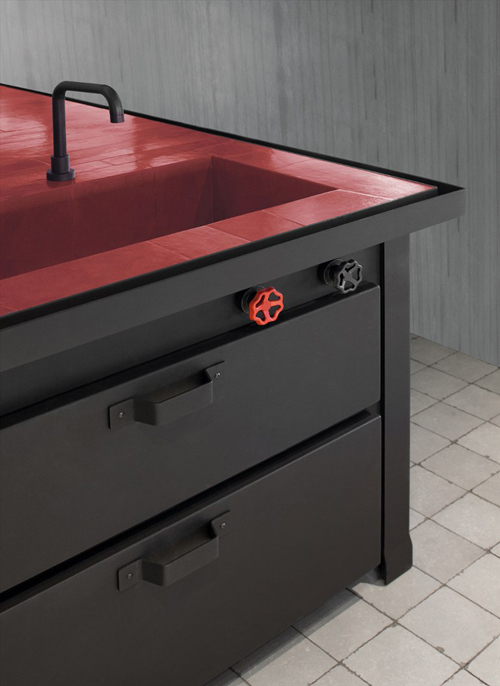 The integrated induction technology, which is only defined by light worktop incisions, gives this design a futuristic and minimal edge while the perforated doors add subtle texturing to the design. A sobering reminder that within kitchen design artistic expression is only allowed to exist as a consequence of functional necessity! The palate here is crisp and futuristic delivering an immediate visual experience. 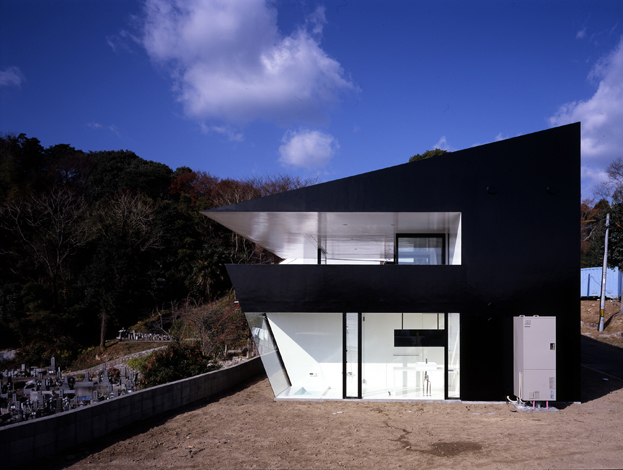 There is presence to this design with sharp stainless steel edges contrasting strongly against the surroundings. The cabinetry backdrop is absorbed by the architecture and the resulting solidarity of colour gives the monolithic functionality even greater authority. Duel islands are certainly trending at the moment and this is a fine example of what can be achieved! The Mogul loves the spiral staircase!! 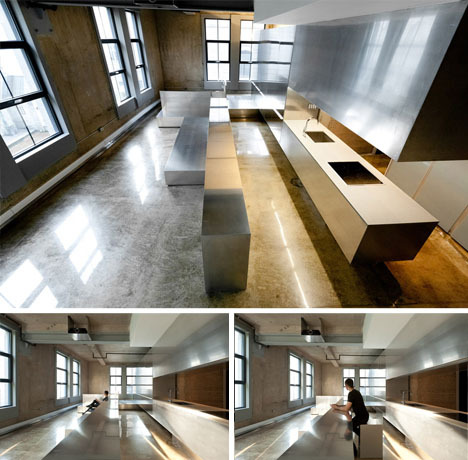 A kitchen within a house within a warehouse! 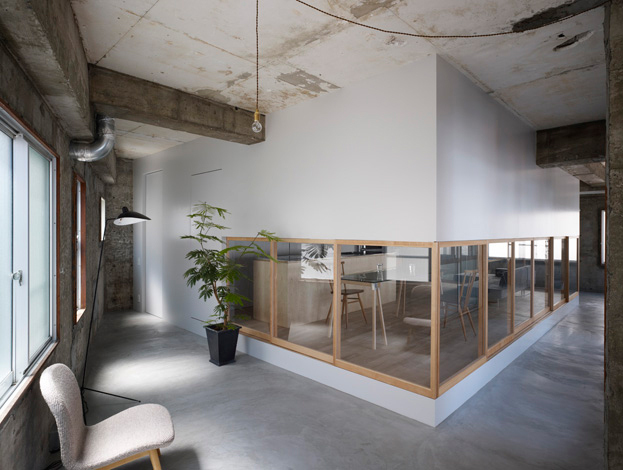 This kitchen has been given an inner sanctum, a protective layer of architectural skin, a buffer against the harsh industrial surroundings, a space that could actually be described as a room. But is this feature a restriction upon the open plan influence the kitchen has recently enjoyed and a regression into the past? 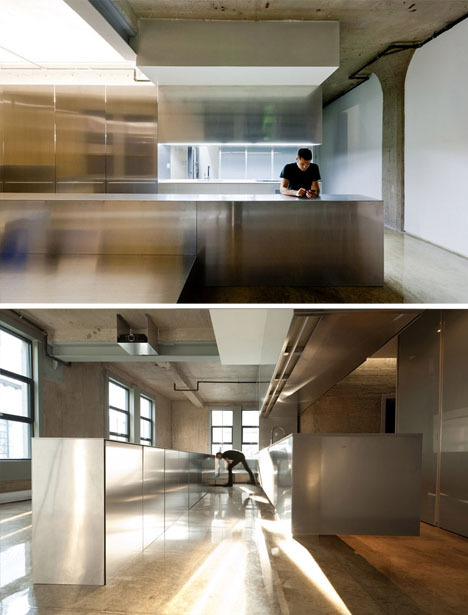 The glass panels expose the somewhat featureless kitchen and living space allowing them to exude a glimmer of warmth into the bleak surroundings. 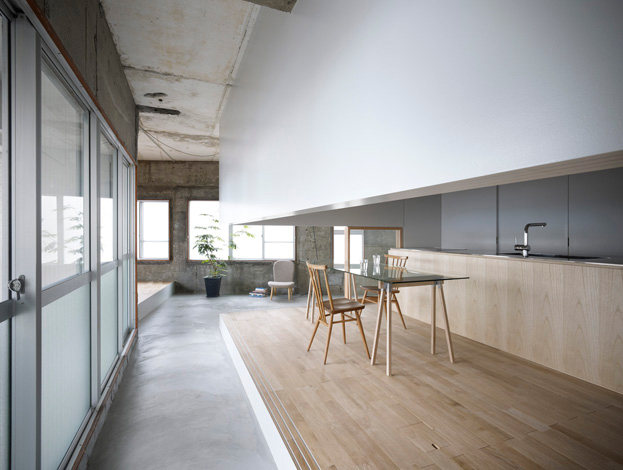 The elevated room level, contrasting materials and independent structural alignments provides the kitchen with further architectural detachment. 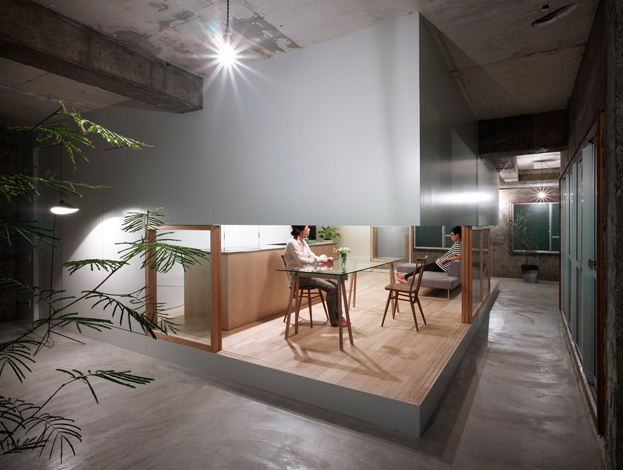 It is as though this is a kitchen within a house within a warehouse! Oh you might want to mind your head when entering or leaving this space. 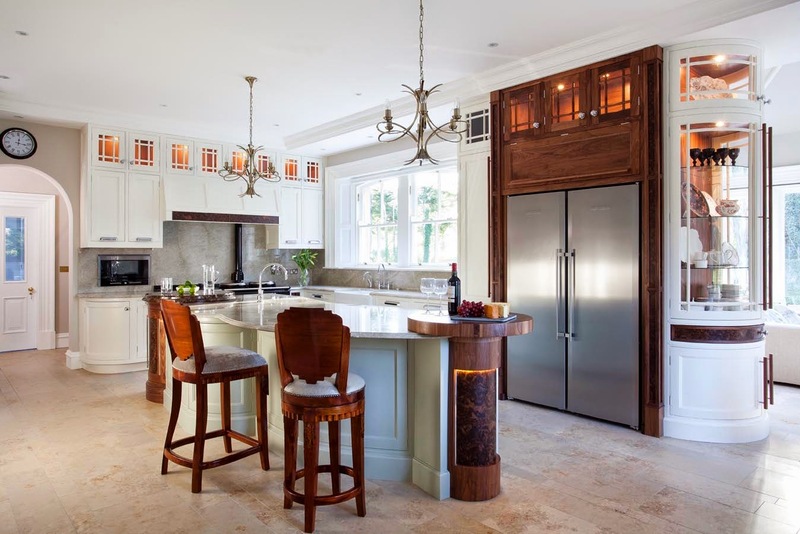 Kitchen design is a functional art form with the ability to influence the surrounding architecture in a way that can encourage harmony and balance. Dramatic material choices can help to categorise functional art but it can also alienate the human desire for comfort and practicality. 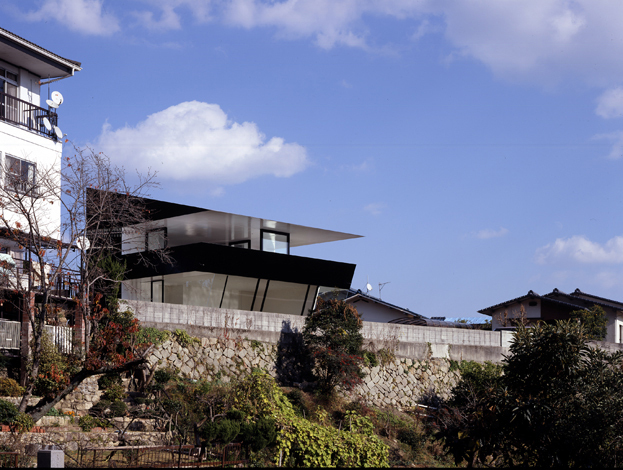 This design is certainly impressive, boasting a futuristic influence upon its regressive and minimal architectural surroundings. 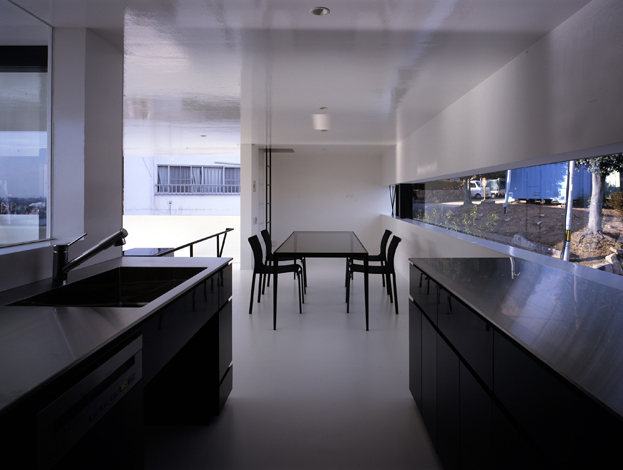 The kitchen is allowed to sprawl out beyond its natural position with an additional line of cabinetry creating a sheltered harbour of functionality for the kitchen. 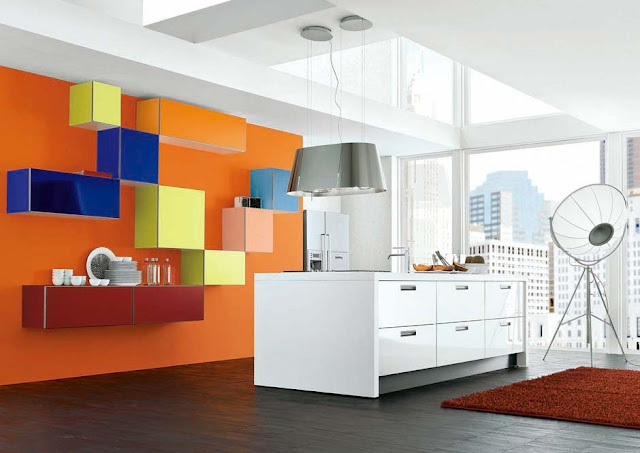 The free hanging and cantilevered cabinetry also helps to deliver a bold and interesting visual experience. 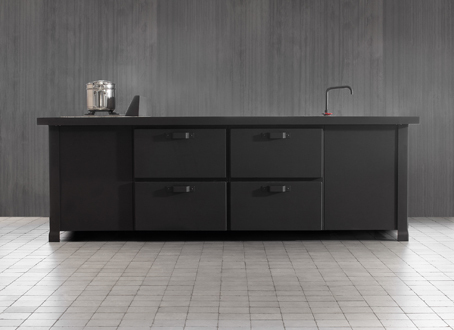 But is it possible that this design has overstepped the mark, becoming art first and kitchen second. 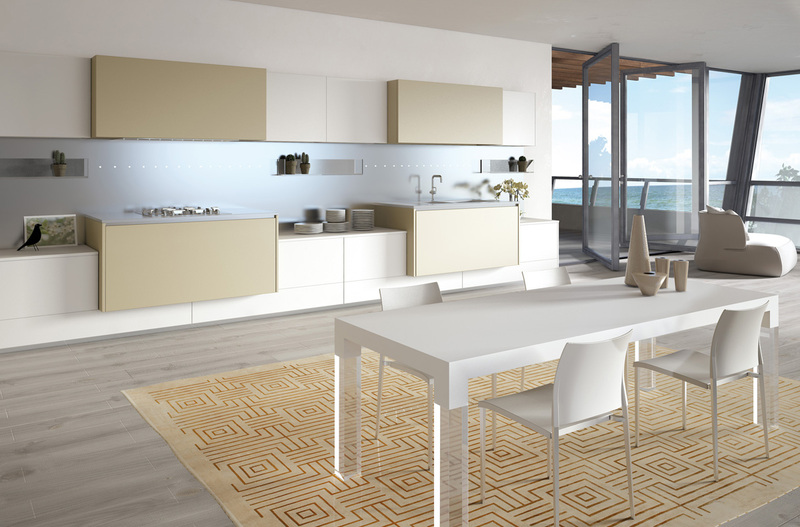 Kitchen design is about creating an aesthetical and artistic impression but it is also about satisfying our pre-programmed desire to be subconsciously soothed within our private living space. This design could be perceived as being clinical and unapproachable. The positioning of the secondary cabinetry outpost towards the centre of the room could be seen as un-necessary and functionally restrictive! The World is an interesting place because we are all different and maybe that is why this design has been created in the way it has! 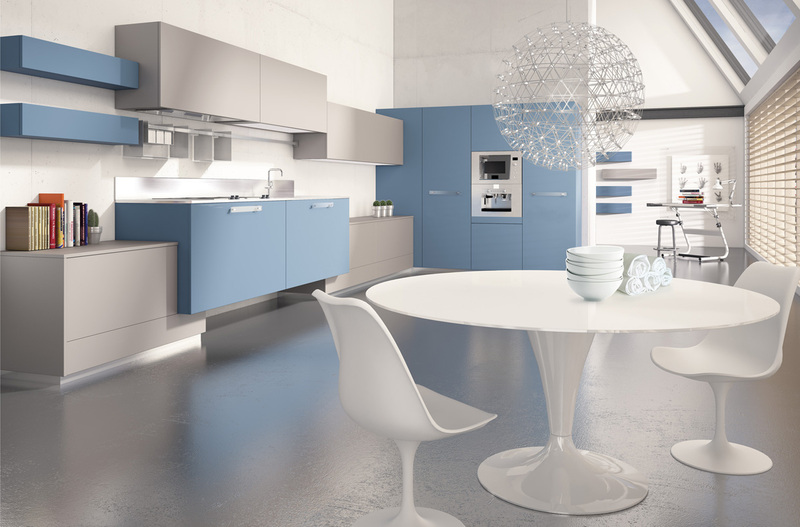 Kitchen designers are empathetic translators of function!